The screen of the Galaxy S 4 phone is important, but you’ll still probably spend more time entering data on the QWERTY keyboard. While it may seem tough at first, it’s designed for simplicity. The software keyboard automatically pops up when the application detects a need for user text input. The keyboard appears at the bottom of the screen. For example, say you’re in Seattle, searching for the Seattle Art Museum via the Mapping application. 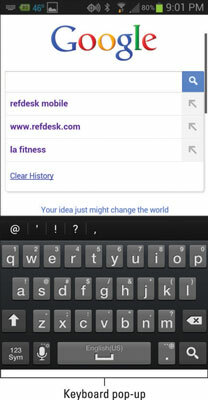 Tap the Search button, and the keyboard pops up onscreen. In this case, a text box pops up in addition to the keyboard. As you type Seattle Art Museum, the text appears in the box on the screen as if you had typed it on a hardware keyboard. The phone is smart enough to know when the keyboard should appear and disappear. If the keyboard doesn’t appear when you want to start typing, you can tap on the text box where you want to enter data. Galaxy S 4 phones come with an enhanced data-entering capability called Swype. This option automatically comes with your phone, and with a little practice, can dramatically speed your ability to type fast on your phone. Here’s how Swype works: Instead of tapping each discrete key on the keyboard, you leave your finger on the screen and swipe from key to key. The Swype application figures out the words you are wanting to type, including inserting the spaces automatically. If you like Swype, you can use it any time that you’re entering data. If you don’t care for it, you can just tap your letters. It’s all up to you! When you are done, you can tap the “done” button, or just be quiet. Within a few seconds, you will see what you said!